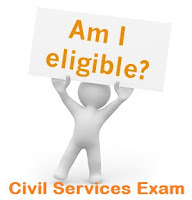 Eligibility conditions for Civil Services Exam - IAS - Daily Current Affairs, IAS Syllabus Exam Strategy, IAS Preparation. upto a maximum of five years in the case of ex-servicemen including Commission Officers and ECOs/ SSCOs who have rendered at least five years Military Service as on 1st August, 2013 and have been released (i) on completion of assignment (including those whose assignment is due to be completed within one year from 1st August, 2013) otherwise than by way of dismissal or discharge on account of misconduct or inefficiency, or (ii) on account of physical disability attributable to Military Service, or (iii) on invalidment. (vi) Upto a maximum of five years in the case of ECOs/SSCOs who have completed an initial period of assignment of five years Military Service as on 1st August, 2013 and whose assignment has been extended beyond five years and in whose case the Ministry of Defence issues a certificate that they can apply for civil employment and that they will be released on three months notice on selection from the date of receipt of offer of appointment. NOTE I : Candidates belonging to the Scheduled Castes and the Scheduled Tribes and the Other Backward Classes who are also covered under any other clauses of para 3(ii)(b) above, viz. those coming under the category of Ex-servicemen, persons domiciled in the State of J & K, blind, deaf-mute and orthopaedically handicapped etc. will be eligible for grant of cumulative age-relaxation under both the categories. NOTE II : The term ex-servicemen will apply to the persons who are defined as ex-servicemen in the Ex-servicemen (Reemployment in Civil Services and Posts) Rules, 1979, as amended from time to time. NOTE III : The age concession under para 3(ii)(b)(v) and (vi) will not be admissible to Ex-Servicemen and Commissioned Officers including ECOs/SSCOs who are released on own request. NOTE IV : Notwithstanding the provision of age-relaxation under para 3 (ii) (b) (vii) above, a physically disabled candidate will be considered to be eligible for appointment only if he/she (after such physical examination as the Government or appointing authority, as the case may be, may prescribe) is found to satisfy the requirements of physical and medical standards for the concerned Services/posts to be allocated to the physically disabled candidates by the Government. The date of birth accepted by the Commission is that entered in the Matriculation or Secondary School Leaving Certificate or in a certificate recognised by an Indian University as equivalent to Matriculation or in an extract from a Register of Matriculates maintained by a University, which extract must be certified by the proper authority of the University or in the Higher Secondary or an equivalent examination certificate. These certificates are required to be submitted only at the time of applying for the Civil Services (Main) Examination. The expression Matriculation/Secondary Examination Certificate in this part of the instruction includes the alternative certificates mentioned-above. NOTE 1 : Candidates should note that only the Date of Birth as recorded in the Matriculation/Secondary Examination Certificate or an equivalent certificate as on the date of submission of applications will be accepted by the Commission and no subsequent request for its change will be considered or granted. NOTE 2 : Candidates should also note that once a Date of Birth has been claimed by them and entered in the records of the Commission for the purpose of admission to an examination, no change will be allowed subsequently (or at any other examination of the Commission) on any grounds whatsoever. NOTE 3 : The candidate should exercise due care while entering their date of birth in column 3 of the Application Form for the Preliminary Examination. If on verification at any subsequent stage, any variation is found in their date of birth from the one entered in their matriculation or equivalent Examination certificate, disciplinary action will be taken against them by the Commission under the Rules. NOTE I : Candidates who have appeared at an examination the passing of which would render them educationally qualified for the Commission’s examination but have not been informed of the results as also the candidates who intend to appear at such a qualifying examination will also be eligible for admission to the Preliminary Examination. All candidates who are declared qualified by the Commission for taking the Civil Services (Main) Examination will be required to produce proof of passing the requisite examination with their application for the Main Examination failing which such candidates will not be admitted to the Main Examination. The applications for the Main Examination will be called sometime in the month of August/September, 2013. NOTE II : In exceptional cases the Union Public Service Commission may treat a candidate who has not any of the foregoing qualifications as a qualified candidate provided that he/she has passed examination conducted by the other Institutions, the standard of which in the opinion of the Commission justifies his/her admission to the examination. NOTE IV : Candidates who have passed the final professional M.B.B.S. or any other Medical Examination but have not completed their internship by the time of submission of their applications for the Civil Services (Main) Examination, will be provisionally admitted to the Examination provided they submit along with their application a copy of certificate from the concerned authority of the University/ Institution that they had passed the requisite final professional medical examination. In such cases, the candidates will be required to produce at the time of their interview original Degree or a certificate from the concerned competent authority of the University/Institution that they had completed all requirements (including completion of internship) for the award of the Degree. Provided that this restriction on the number of attempts will not apply in the case of Scheduled Castes and Scheduled Tribes candidates who are otherwise eligible. Provided further that the number of attempts permissible to candidates belonging to Other Backward Classes, who are otherwise eligible shall be seven. The relaxation will be available to the candidates who are eligible to avail of reservation applicable to such candidates. Provided further that a physically handicapped will get as many attempts as are available to other nonphysically handicapped candidates of his or her community, subject to the condition that a physically handicapped candidate belonging to the General Category shall be eligible for seven attempts. The relaxation will be available to the physically handicapped candidates who are eligible to avail of reservation applicable to such candidates. i am a final year student during 2013-2014.Can i attempt the exam? Yes an appearing student may appear in preliminary exam. Forms already filled, even preliminary exams are over for this year. However, you were eligible. 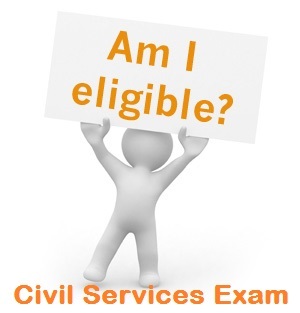 Is there any minimum percentage required to appear in IAS and state public service commission exam.? Hi, My DOB is 10/05/1982. I am eligible for age relaxation of 3 yrs as per OBC non creamy layer. I am eligible for appearing Prelims and Mains.. But as per scheduled Interview test i.e. on Apr-May 2015, I will complete 33 years as on 1st of August 2015.. Will this make me ineligible? Pls reply.. Thanks in anticipation. sir i wanna know that i had given the exam of ias in 2003/2004 but i donot remember the exactly . what shud i do in the regard. i am persuing bba through distance mode....will i eligible for civil service exam?? my dob is on 23-04-1993 and i'm 4th year b.tech student i'm i eligible for prelims?